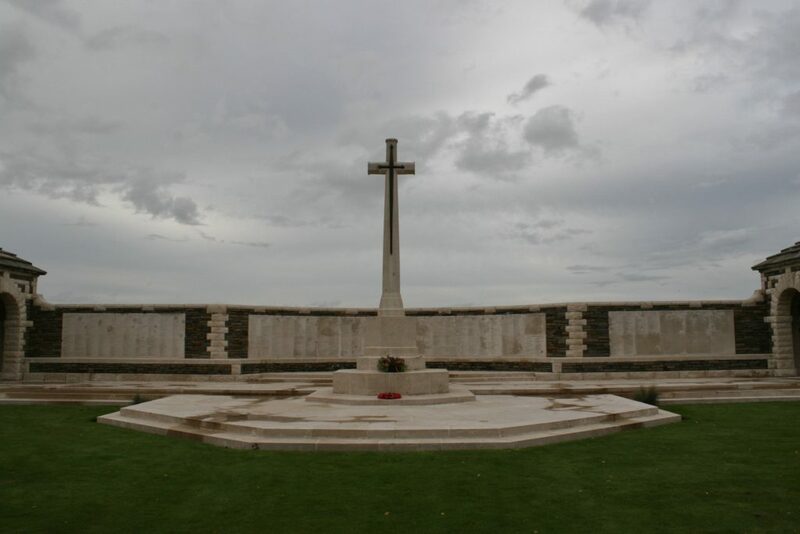 And so we find ourselves on the battlefield of Fromelles. 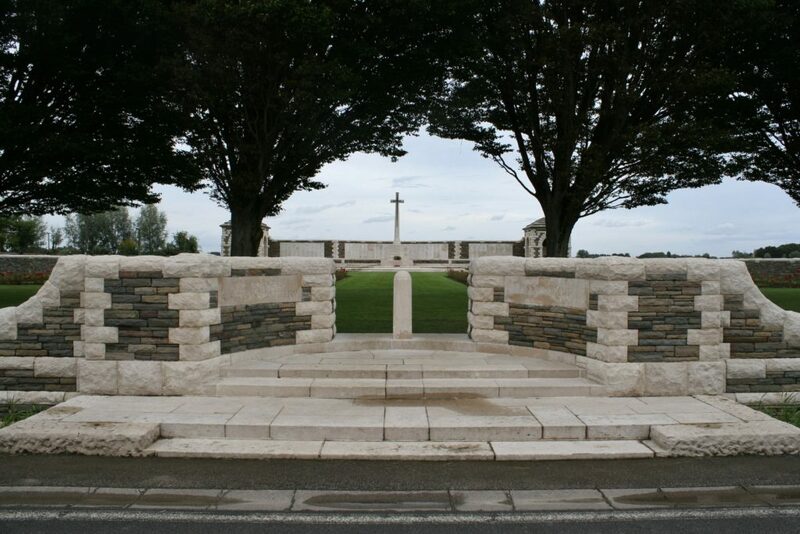 Half a mile south east of Le Trou Aid Post Cemetery, this is V.C. Corner Australian Cemetery and, beyond the Cross of Sacrifice, the Australian Memorial that stands within. Cemetery entrance (above & below). 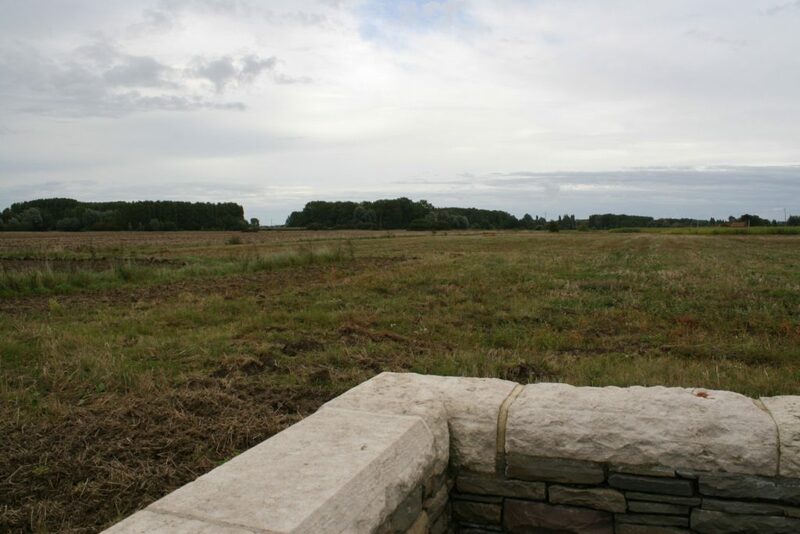 We have just crossed the site of the old front line and are now in what was once upon a time No Man’s Land between the Australian and German lines. 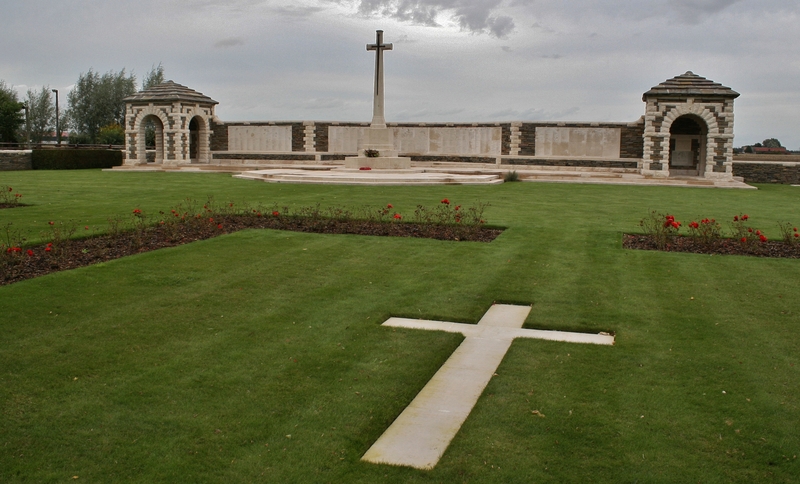 We are entering one of the most unusual cemeteries on the Western Front, and the reasons are pretty obvious. This is one of only two all-Australian cemeteries* on the Western Front and, uniquely, it is the only one where there are no headstones. *the other, Toronto Avenue Cemetery, can be found within Ploegsteert Wood and no, despite the name, there are no Canadians buried there, only Australians. 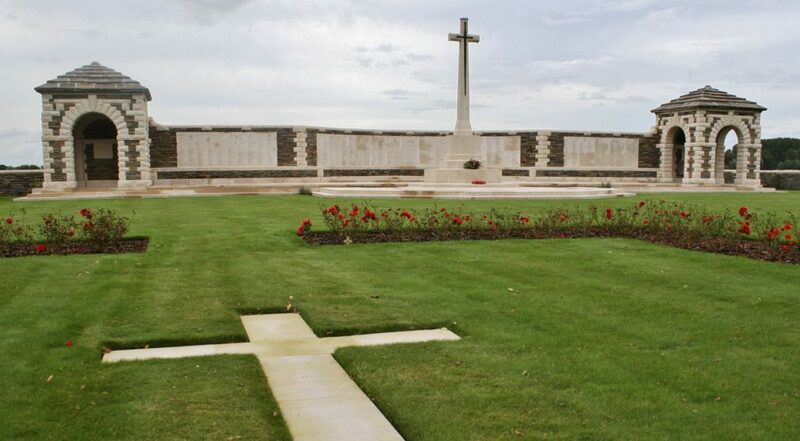 The cemetery was made after the war, and 410 Australians, not one of whom could be identified, lie buried in two mass graves beneath the two crosses on either side of the central grass walkway. 410 rose bushes, so they say, grow here too. You may think that the cemetery plan is not worth looking at, but ‘mass graves’ are not necessarily as you might expect, and this cemetery plan, I suggest, reveals a lot more than many (why, do you think, are some rows numbered, yet many are not?). 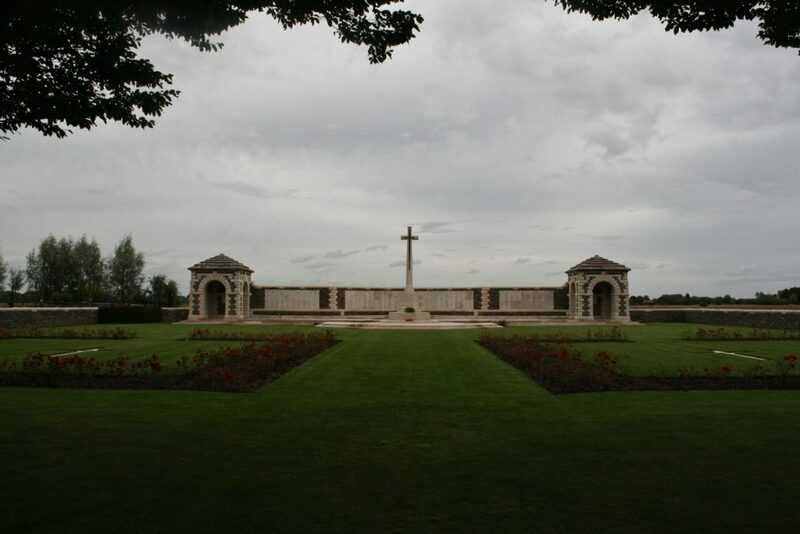 Cross of Sacrifice and the Australian Memorial at the north eastern end of the cemetery. 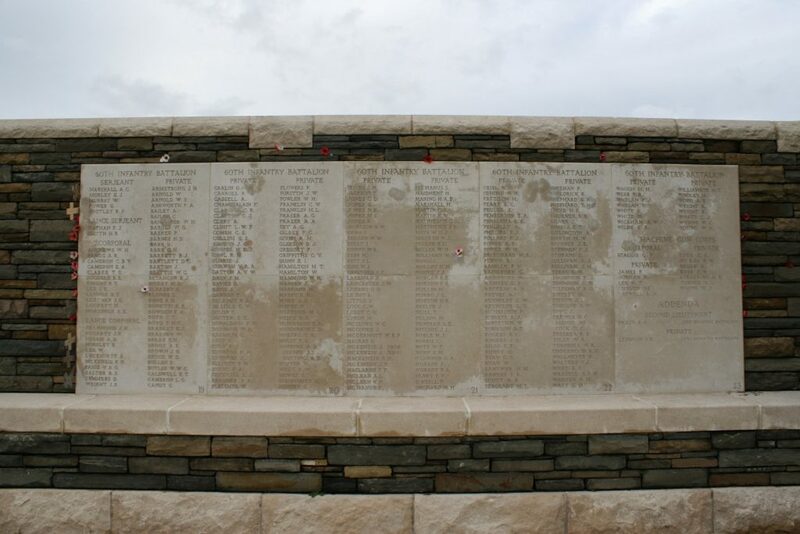 The memorial is inscribed with the names of men who fell in the fighting at Fromelles and whose bodies were never found. 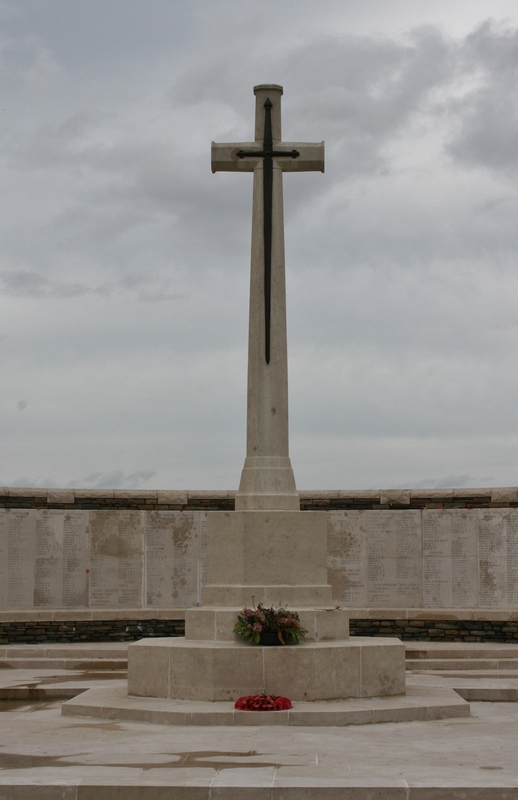 Cross of Sacrifice. V.C. 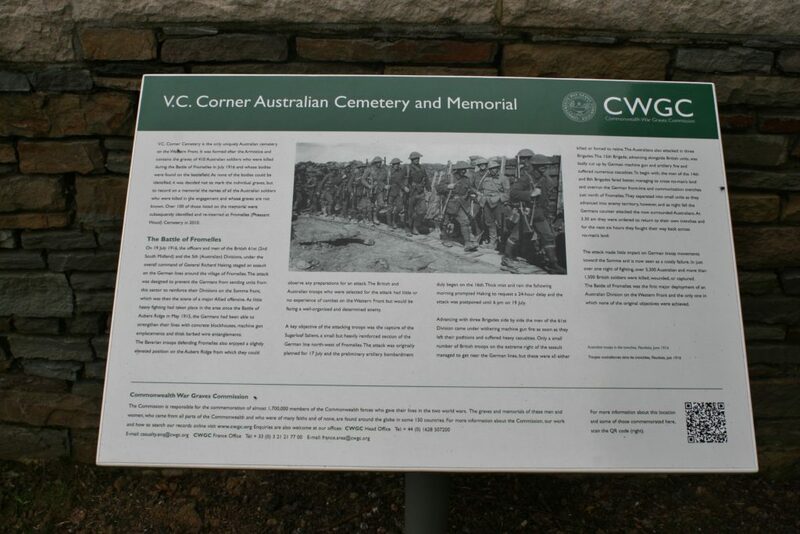 Corner was thus called because at least seven V.C.s were won in the immediate surrounding area during the course of the war. Probably. …flanked on either side by two smaller ones (above & below). For some reason it seems nobody actually agrees on exactly how many names there are on the panels. 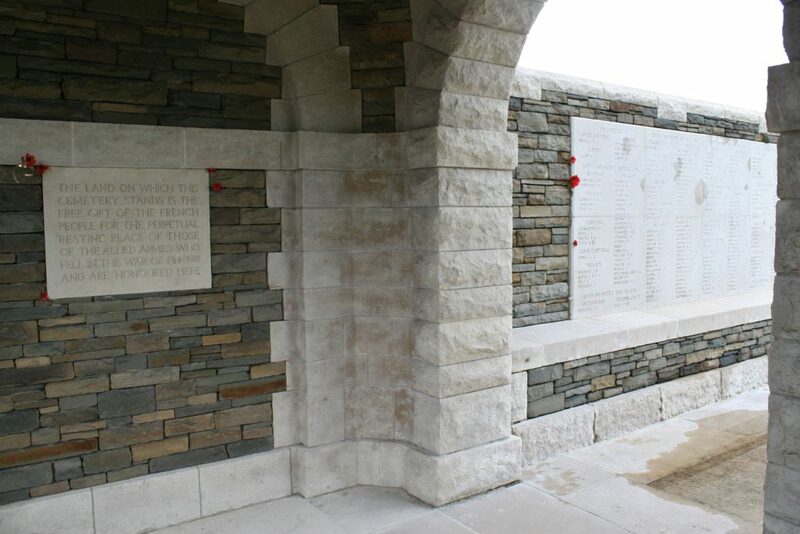 Here’s a small selection of possible numbers from across the web; ‘The memorial, designed by Sir Herbert Baker, was built to commemorate nearly 1,300 Australian casualties; The Memorial to the Australian Missing of Fromelles covers stone tablets in the wall at the rear, and there are 1294 names inscribed here; At the back of the plot stands a memorial which bears the names of the 1,208 Australian soldiers who lost their lives in the offensive but whose graves were never found; The memorial commemorates 1,184 Australian casualties; Beyond the cemetery is a memorial wall commemorating by name 1,299 Australians who died in the Battle of Fromelles and who have no known grave’. So take your pick. Or count the names. 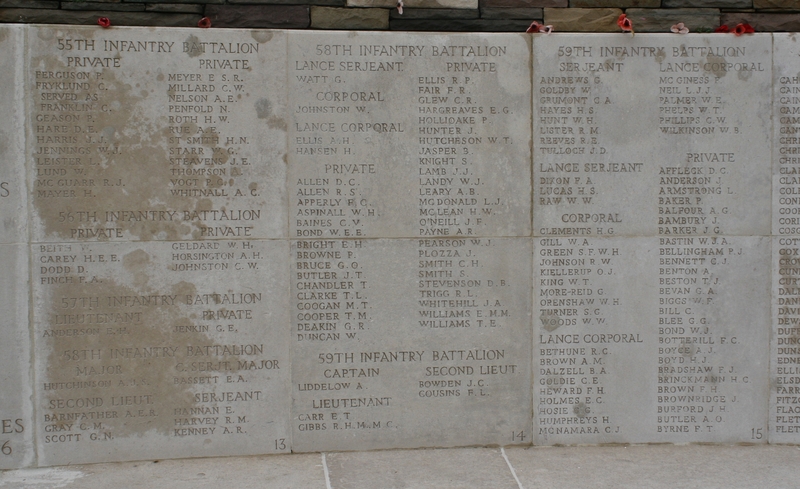 Here are the panels in close-up. 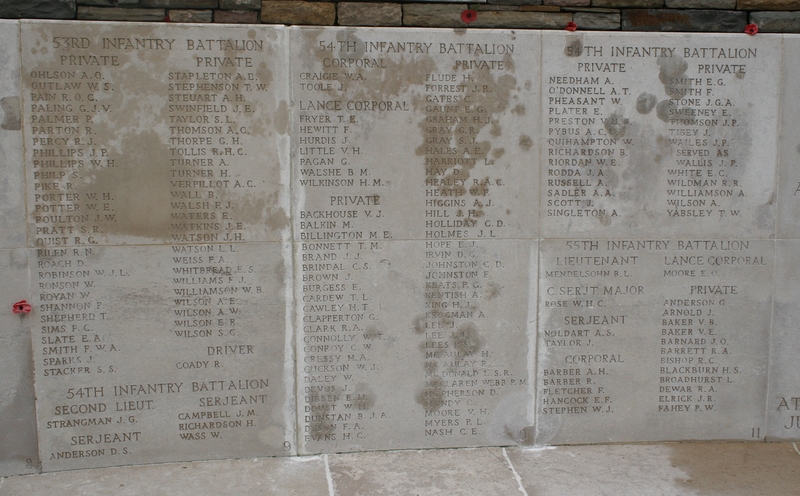 Central panel. Which quite clearly says that 1,299 men are remembered here. 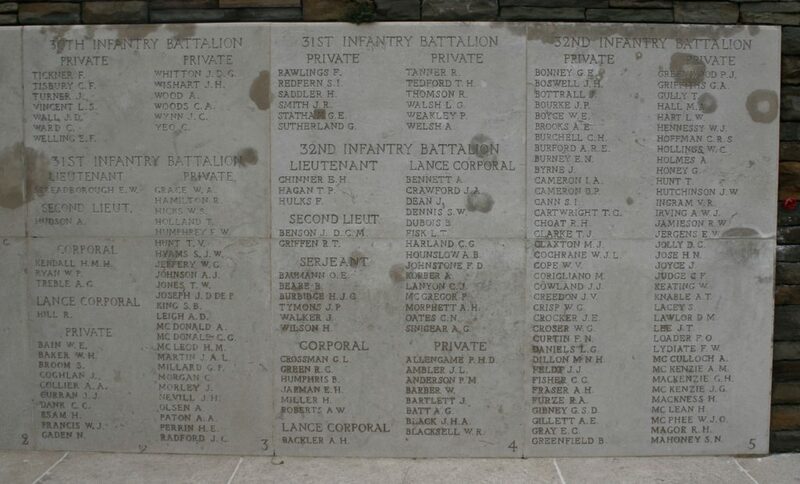 And at the time the memorial was inaugurated in the early 1920s, 1,299 was correct, of course; ww1westernfront.gov.au, which quotes this figure, also includes a very handy photograph which shows the final panel, Panel 23, at the bottom of which the two names beneath the Addenda heading you can see in my picture (below) are noticeable by their absence. Add these two names to the 1,299, and you get 1,301, and that is indeed the correct figure. There are, as of 2016, 1,301 names (counting the handful of aliases as one name, not two!) 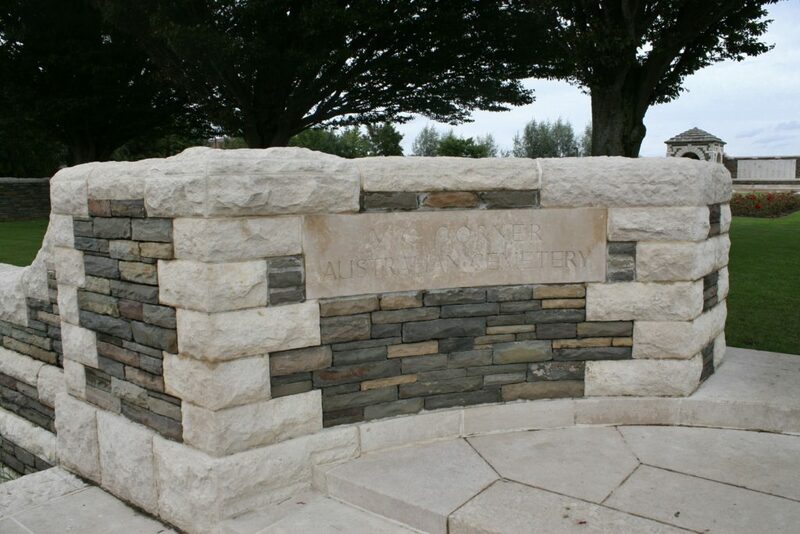 inscribed on the panels, and that’s a fact. And yes, I have counted them. Just in case. In the years immediately following the construction of V.C. 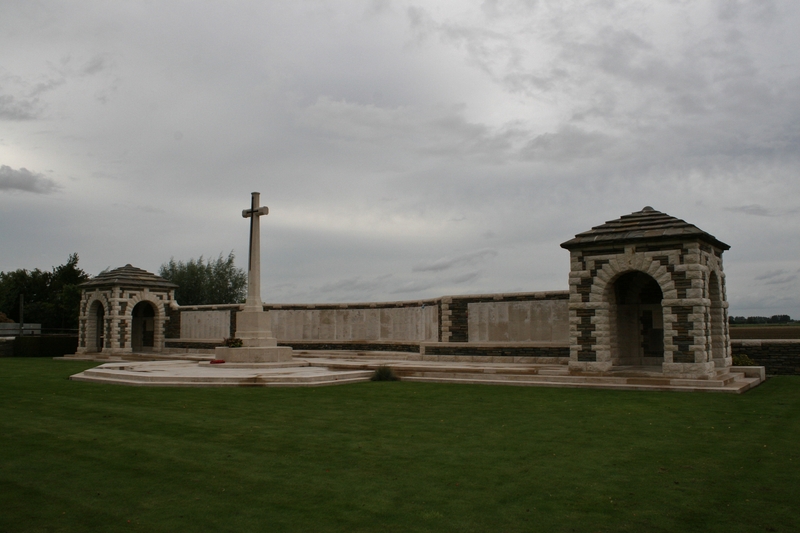 Corner Cemetery, the bodies of five men whose names are inscribed here were discovered on the battlefield, but their names were never removed from the panels. 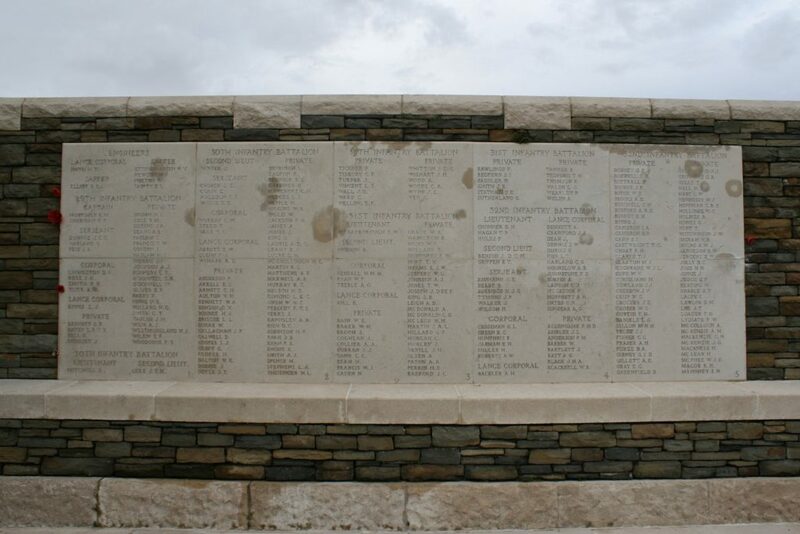 In more recent times the discovery of the mass graves at Pheasant Wood, and the subsequent identification, as of 2016, of 150 Australian soldiers, means that many more men listed on the memorial as missing have now been identified. 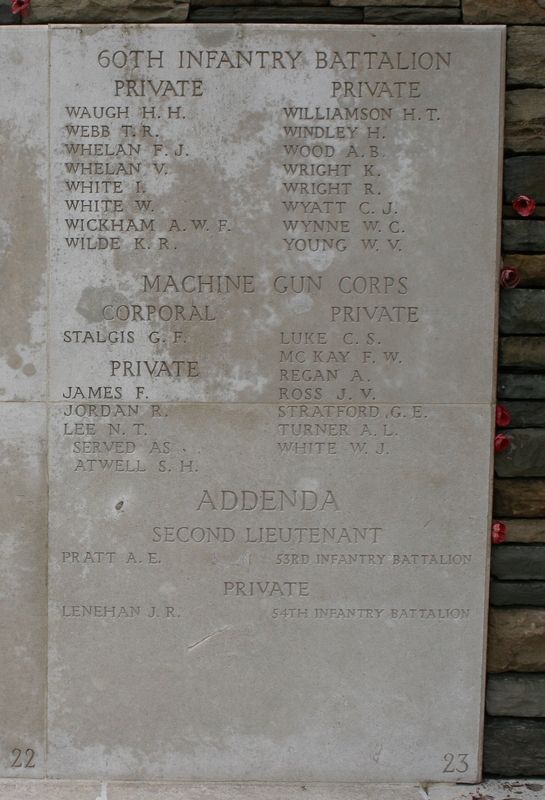 Not all the men identified were originally remembered here at V.C. Corner. 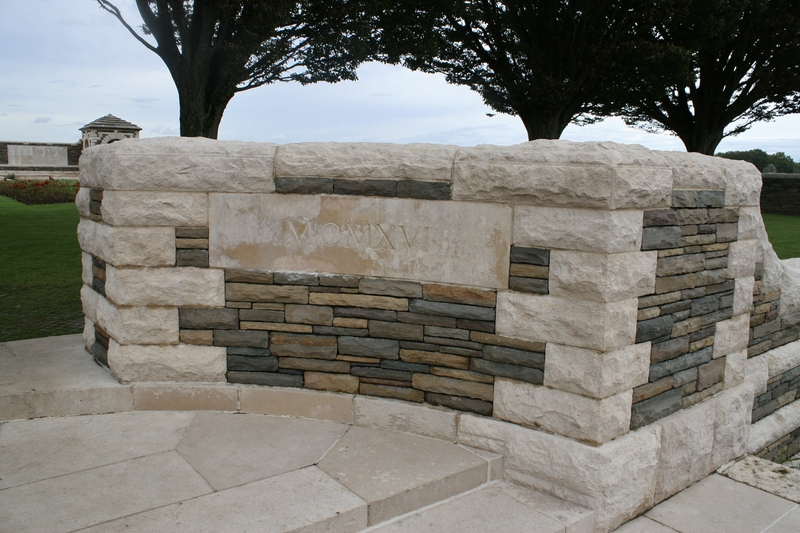 For example, six others whose names are inscribed on the Australian National Memorial at Villers-Brettoneaux (where we shall also pay a visit one of these days – once I sort out all the photos!) 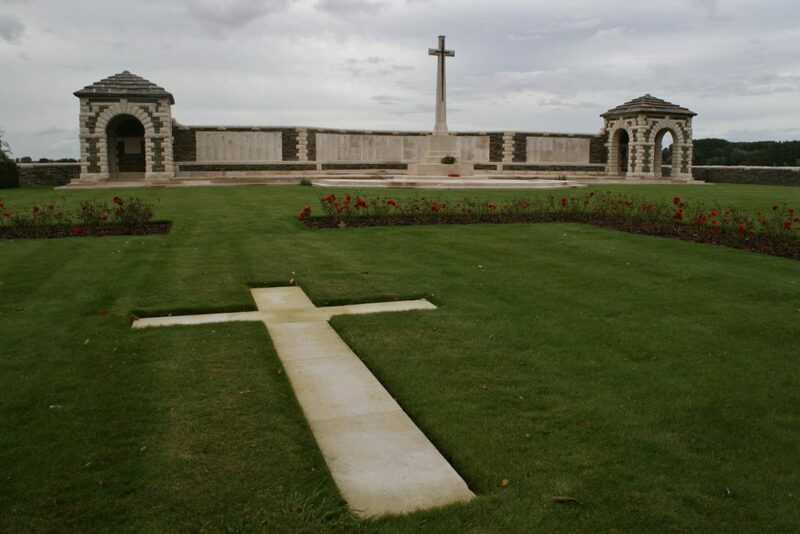 were found to be among the dead at Pheasant Wood, and I believe that another man is thought to already be among the graves at Rue Petillon Military Cemetery. …housed in one of the buildings at either end of the memorial. 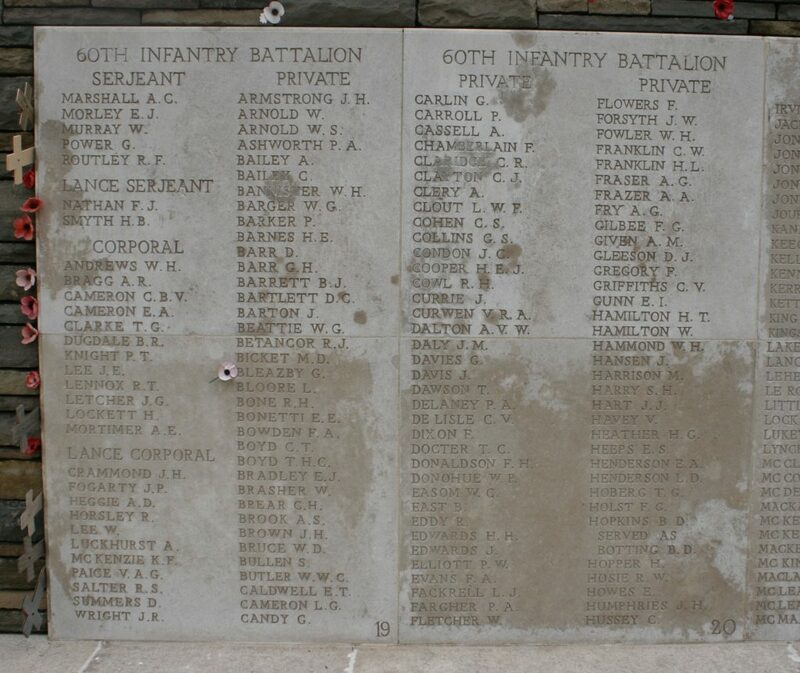 …someone hasn’t forgotten Private Baker, who was killed on 20th July 1916. You’ll find him on Panel 11; you’ll also find out what actually happened to him if you check out the comments section at the end of this post. …before, as we pan left, disappearing straight through the large gap in the trees on the horizon. 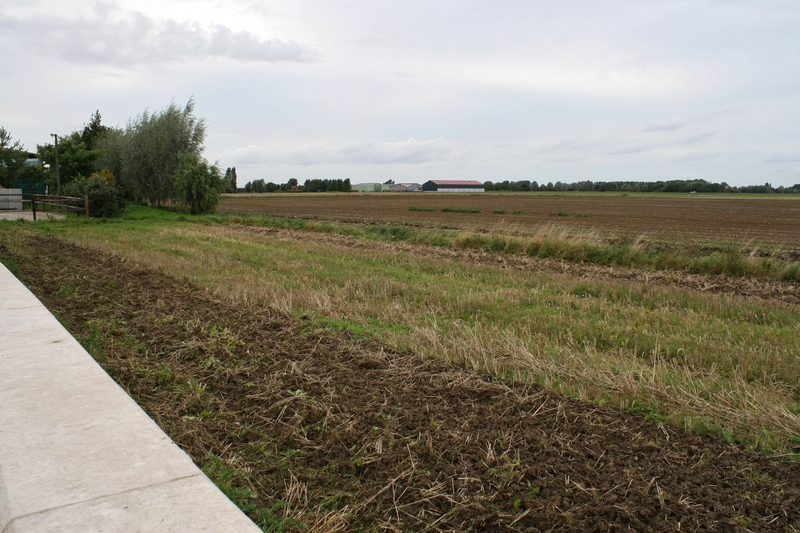 It looks a long way away to me, but it was in this area that Australian troops succeeded in crossing No Man’s Land and breaking through the German lines on the evening of 19th July 1916, as we shall see next post. 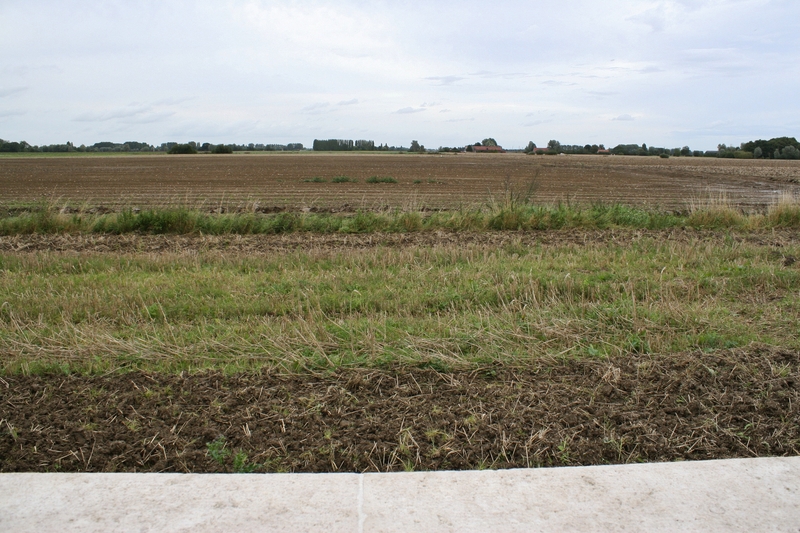 …continuing obliquely towards the trees on the extreme right, the edge of the same small wood through which the German lines passed as we saw a couple of photos back. 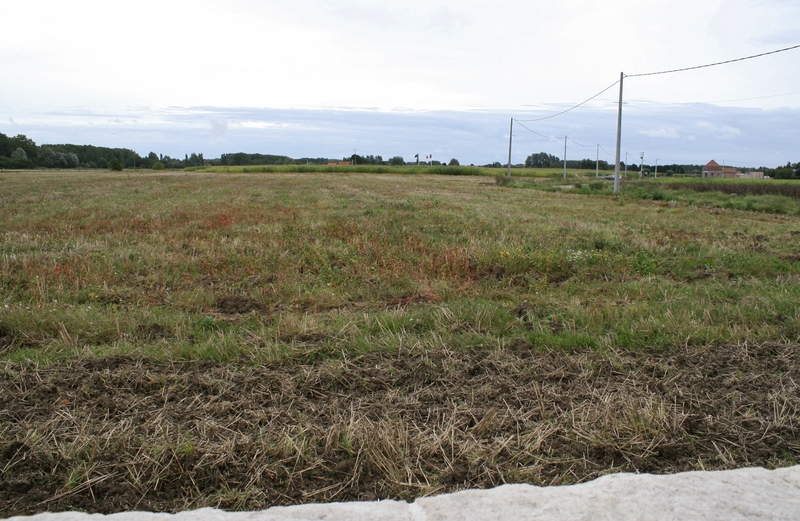 As you can see, No Man’s Land was several hundred yards wide here, although narrowing considerably where the wood now grows. No Man’s Land panorama looking from north to east, the British lines crossing the field on the left, the Germans just out of shot to the right. Next we shall visit the Australian Memorial Park, and at last tell the story of what actually happened in these now peaceful fields. You certainly know how to attract my curiosity Magicfingers! Your comment about Vivian Ernald Baker 3245 particularly caught my eye. 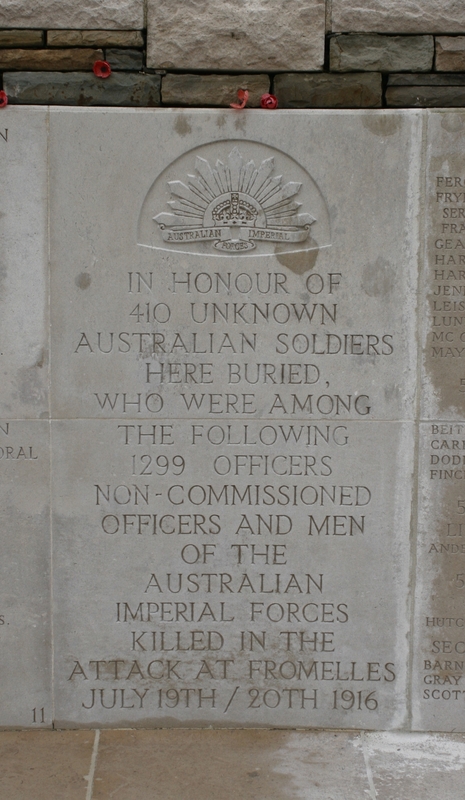 I discovered the following submitted by Kim Cummins on a website “Honouring the Anzacs”. 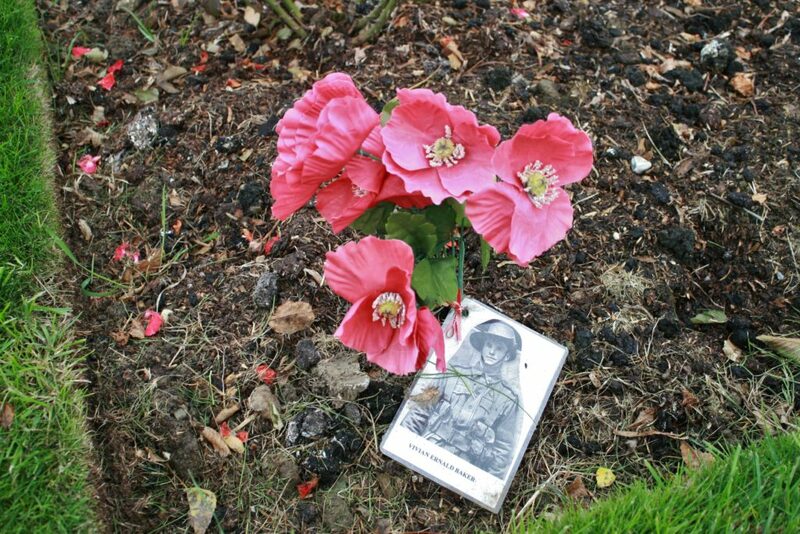 It was accompanied by rather gruesome albeit poignant official documents including “Kit” returned to his next-of-kin: “Metal Wrist Watch (damaged), Watch Strap, Photo, Card ….. Testament, Prayer Book, Wallet, Photos, Cards, Lock of hair”. From the records these items were removed by a mate nearby for handing into the Company Orderly Room. 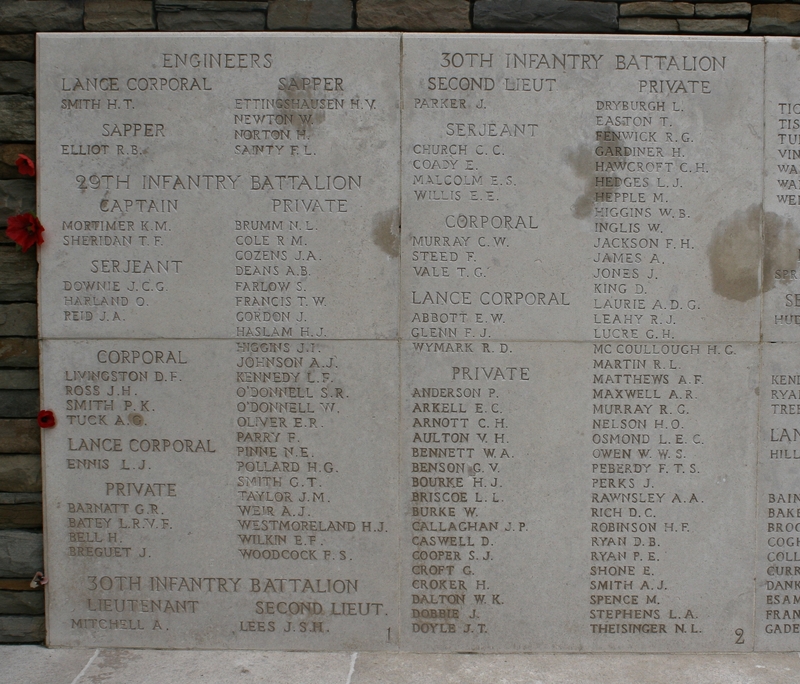 Another mate Service Number 3152 made a statement saying Baker “was buried near Sailly, a service being read over him by the Rev Green”. 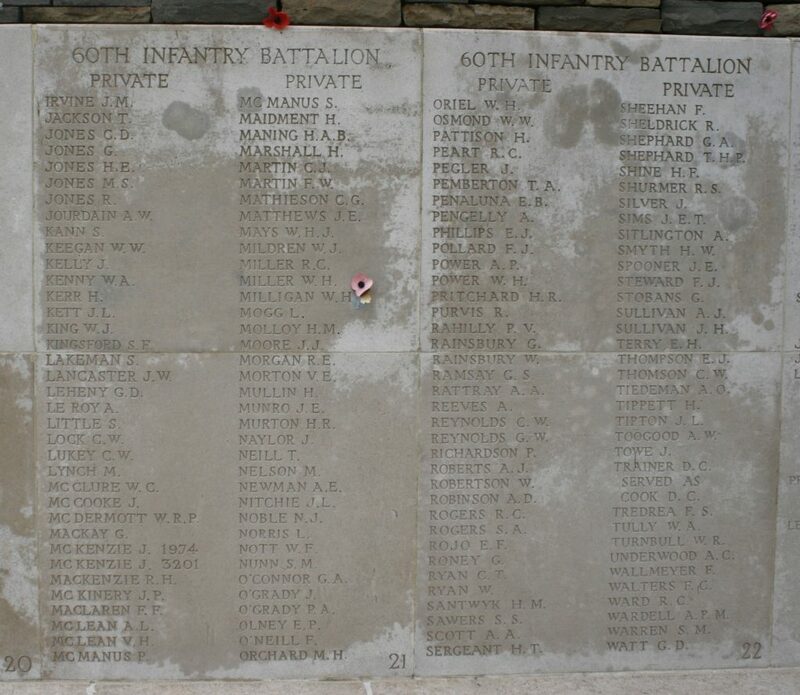 This important comment must be subsequent to his body being left in the trenches when the 55th Battalion was withdrawn on the morning of 20th July. I wonder why Kim Cummins omitted that part – this made me more comfortable knowing he was indeed buried rather than just “left in the trenches”. I wonder if Kim Cummins placed the photo. 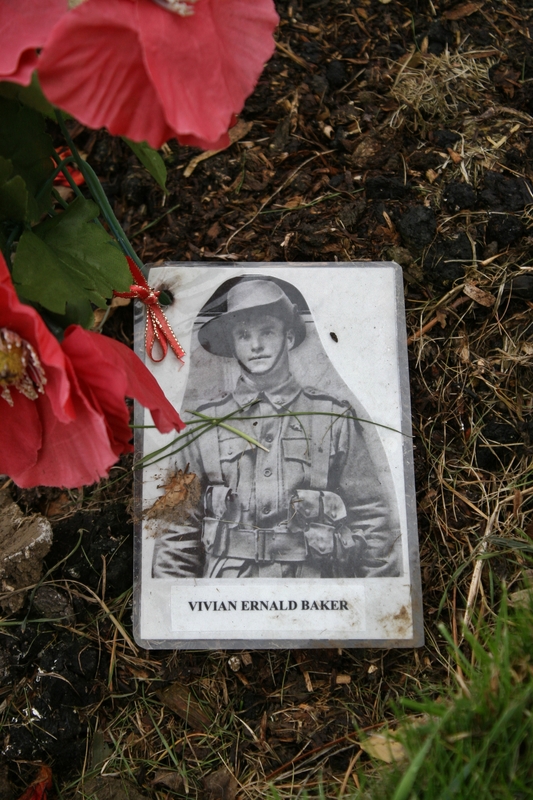 Private V E Baker was born at Blandford NSW. He was a 22 year old Farmer at the time of enlistment. 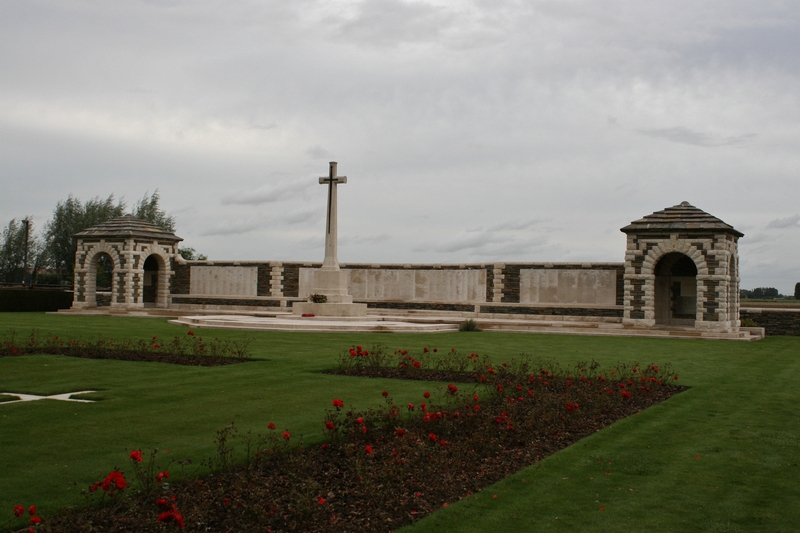 His next of kin was father, Alfred Andrew Baker of Blandford. 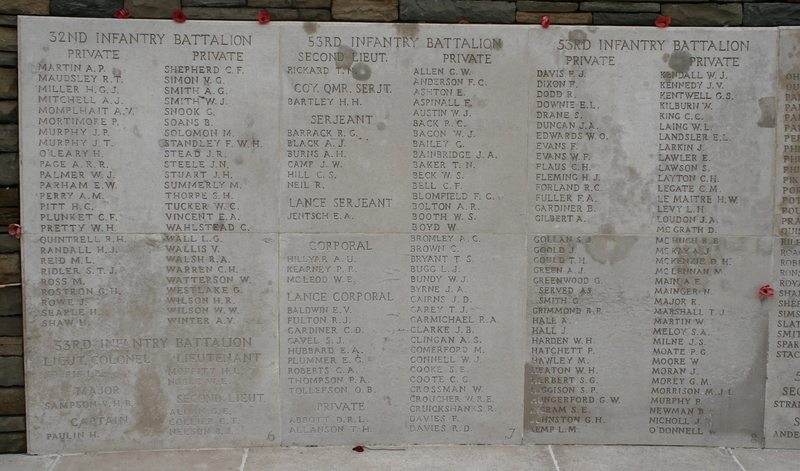 He enlisted on the 28th July 1915 at Newcastle NSW. He embarked at Sydney on H.M.A.T A14 Euripides on the 2nd November 1915. 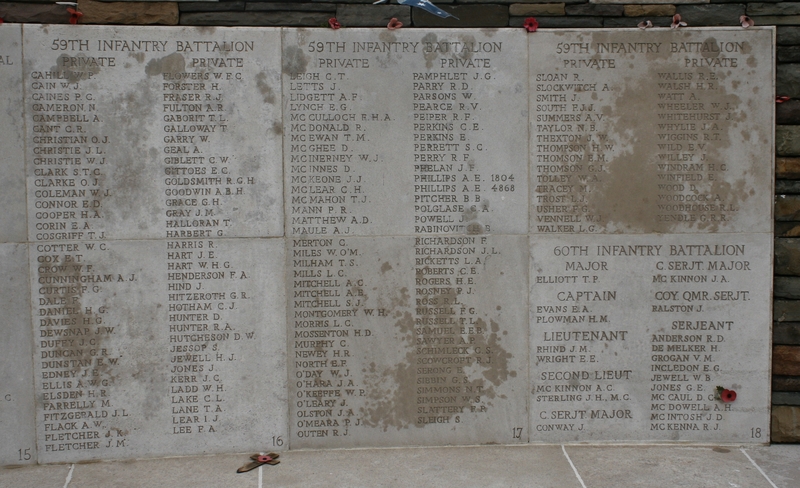 He joined the 55th Battalion AIF and marched out to Fromelles. 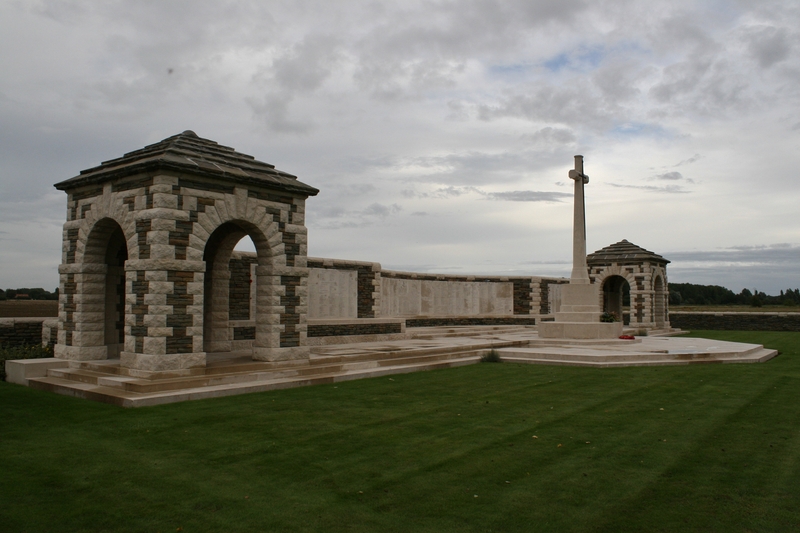 On the 20th July 1916, Private Baker was in the front line trenches at Fleurbaix and at 9am, when shooting over the parapet, he was hit by a bullet in the left temple. The bullet went right through his steel helmet and came out through his right ear. His body was left in the trenches when the 55th Battalion was withdrawn on the morning of the 20th July. He was known as “Vivi”. I try Sid, I try. Fantastic information on Private Baker! I have added something to the text to refer people to your research. Thankee kindly.